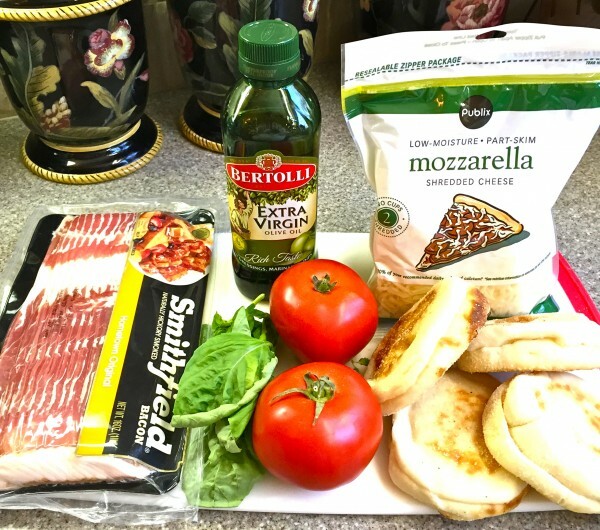 Bacon and Tomato English Muffin Pizza may not be fancy-schmancy enough for a dinner party, but it is a quick, easy, versatile and delicious dish that you definitely want to add to your menu rotation and it would be perfect for Mother’s Day or Father’s Day! 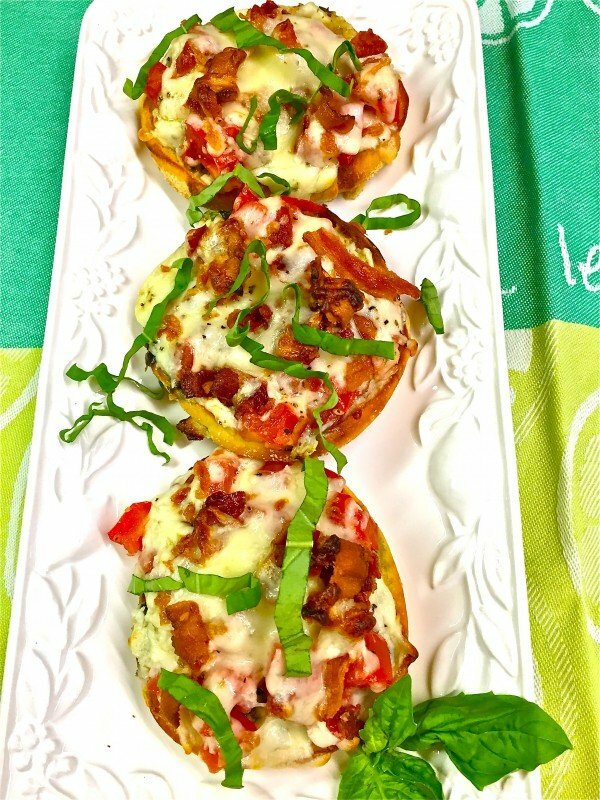 Of course, even though it might not make it to your table when you have company over, Bacon and Tomato English Muffin Pizza is still perfect for an afternoon snack for the kids, a quick casual lunch or dinner, a great party appetizer, and my personal favorite, breakfast! That’s right, breakfast! Now, I do have to admit that I like cold leftover pizza for breakfast. But this delectable, portable, no knife or fork needed, this circle of deliciousness doesn’t bear any resemblance to cold, starchy, sometimes gummy leftover take-out pizza. It’s a healthy way to add some veggies to the most important meal of the day, and a wonderful way to start your day. In fact, I had one this morning! I’m sure you have had English Muffin Pizzas before that were just so-so. 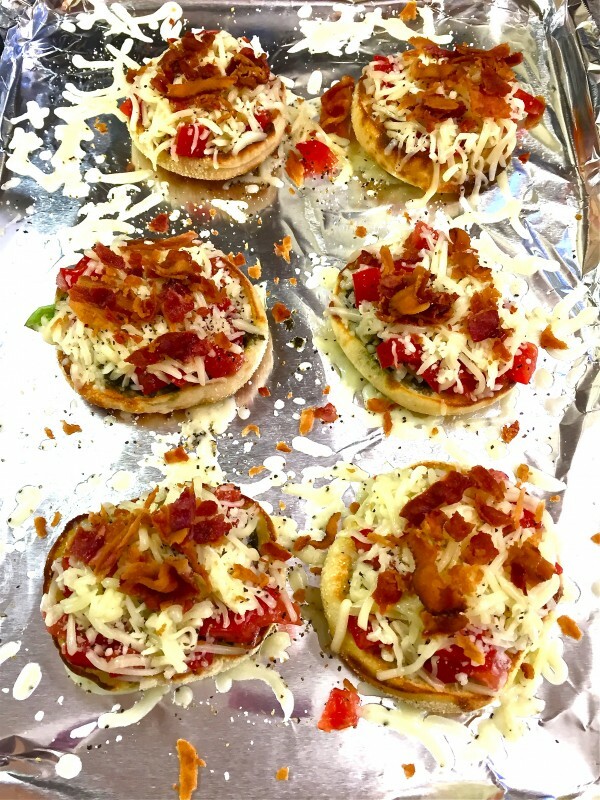 But, before you dismiss this idea, please try this yummy combination of crunchy English muffins, pesto, fresh tomatoes, crispy bacon and gooey melted mozzarella cheese. Of course, the sky is the limit with pizza toppings, and you can certainly substitute your favorite toppings for the bacon and tomato, but at least, try it with the pesto instead of pizza sauce. You won’t believe how much it elevates the flavor of the pizza. Speaking of pesto, if you are not already a fan of pesto, you should give it a try. It is a versatile condiment that can be used in almost any dish, particularly pasta dishes, or soups or stews to give them another layer of flavor. I always keep a jar in my pantry, but you can also buy refrigerated pesto or even make your own. The other thing that I highly recommend for this recipe is refrigerated sourdough English Muffins. You can use regular English Muffins or whole wheat, but in my opinion, the sourdough muffins are crisper and have a better taste. You can usually find them close to the eggs in your grocery store. Looking for more breakfast or brunch ideas and recipes, check out my easy 32 Mother’s Day Breakfast and Brunch Recipes! The ingredients for these quick pizzas include refrigerated sourdough English Muffins, fresh tomatoes which have been seeded and diced, jarred pesto, bacon, mozzarella cheese, salt and pepper, and fresh basil for garnish. The first thing you need to do is toast your muffins. I know you have probably had English Muffin Pizzas that weren’t toasted first and they are usually really soggy and gummy, exactly the opposite of the taste we are going for. To make clean-up a snap, line a baking sheet with foil and spray lightly with non-stick cooking spray. Top each of your English muffin halves with a heaping tablespoon of jarred pesto and spread out evenly. Then, place your English muffin halves on the baking sheet and put under your broiler for 1-3 minutes. Watch them carefully, because they can go from not quite done to burned in a few seconds. You do want them to be browned and crusty looking. Turn your oven down to 450 degrees. Next, seed and chop your tomato. If you don’t know how to seed a tomato, click on this link to watch a quick video showing you how to seed a tomato. This step is important because too much tomato juice will make your pizzas soggy. Top each English muffin half with a good amount of the chopped tomato pieces. Season to taste with salt and pepper. Sprinkle 1 slice of cooked and crumbled bacon on top of the tomato on each English muffin half. Then, top with as much shredded mozzarella cheese as will stay on. 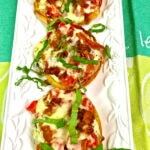 Place the English Muffin pizzas in the oven and bake for 10-12 minutes, or until the cheese has melted and is bubbling. Garnish with fresh basil. 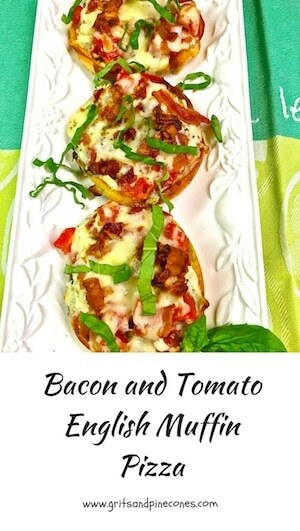 Bacon and Tomato English Muffin Pizza may not be fancy-schmancy enough for a dinner party, but it is an easy, delicious dish that you should try for breakfast! To make clean-up a snap, line a baking sheet with foil and spray lightly with non-stick cooking spray. 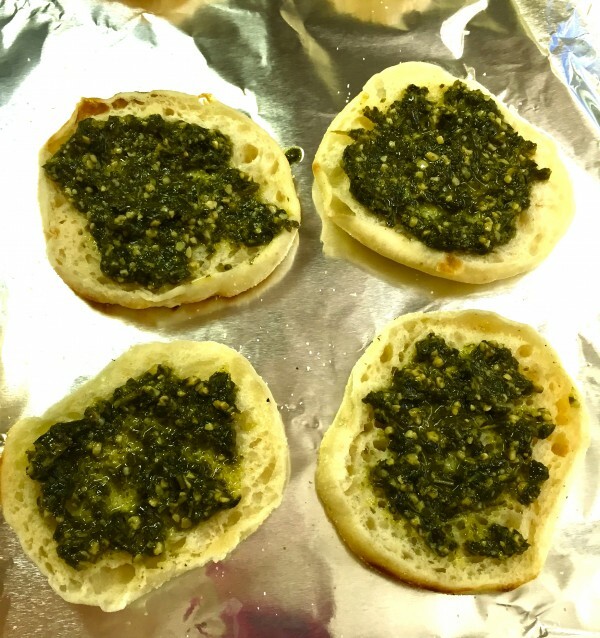 Top each of your English muffin halves with about a tablespoon of jarred pesto and spread out evenly. Place your English muffin halves on the baking sheet and put under your broiler for a few 1-3 minutes. Watch them carefully, because they can go from not quite done to burned in a few seconds. You do want them to be brown and crusty looking. Turn your oven down to 450 degrees. Next, seed and chop your tomato.This step is important because too much tomato juice will make your pizzas soggy. Top each English muffin half with a good amount of the chopped tomato pieces and season to taste with salt and pepper. HOLY SMOKES!! That looks so Deeelicious!! You are SO FUN!! Always Impressive!! Nice Job! Can’t wait to try! !